Superiorpapers.com is one of the leading essay writing services with more than 15 years of writing experience until now. This company was established 1997 and until now they have created an impressive reputation among customers and other writing companies which is based on wide offer, good client support policy, and educated writers with MA or PhD Degrees. The service offered by this company is very comprehensive and it is organized into four major categories – Writing Service, Dissertation Services, Assignments, and Editing. All these services are offered for High School, Undergraduate, Master and PhD students. Writing service includes the whole spectrum of academic writing forms – essays, term papers, research papers, coursework, reviews, articles, research summaries, presentations, and many others. Dissertation services are created for students who need dissertation and thesis writing or editing. Additionally, this company offers dissertation proposal writing. Superiorpapers.com offers assignment solutions including case studies, lab reports, math/physics/economic/statistics projects, programming, online assignments, and etc. Price of the paper depends on type of paper, urgency, number of pages, subject area, quality level, and extras. Firstly, type of paper can affect the price because writing of complex writing forms (dissertation and thesis), and assignments solutions are more expensive than writing and editing service. Deadline influence the total cost of paper significantly. It goes from 24 hours to 2 months. For instance, dissertation writing, regardless academic level costs $19.99 per page for a 2 months deadline, or $27.99 per page for 3 day deadline respectively. At the same time, Essay writing costs $19.99 per page with a 10 day deadline, or $24.99 per page with a 3 day deadline. Additionally, editing is much cheaper compared to writing and it costs $12.99 per page. The next factor that affects price is quality level. 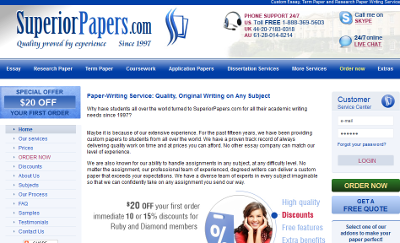 Superiorpapers.com for writing and assignment service offers three quality levels – Standard, Premium and Platinum, while for dissertation they offer four levels – Undergraduate, Master, Specialized, and PhD. Additional factor which influence total cost is subject area since papers related to engineering and technology are more costly than papers in other subjects. For instance, essay writing about history costs $19.99 per page, while papers about technology are $32.99 per page. This company offers several extra services such as TOP 10 writers ($11), originality reports ($4.95), proofreading by editor ($8.25), VIP service ($11.55), and UK writer (+5%). Finally, superiorpapers.com has $20 discount for all first time orders, returning customers discount, upgrade membership discount and free features (which cost $65 in total). All in all, this company has a very strong reputation among customers for a good reason since they have wide offer, and excellent client support team. They guarantee originality, educated writers, privacy and satisfaction.